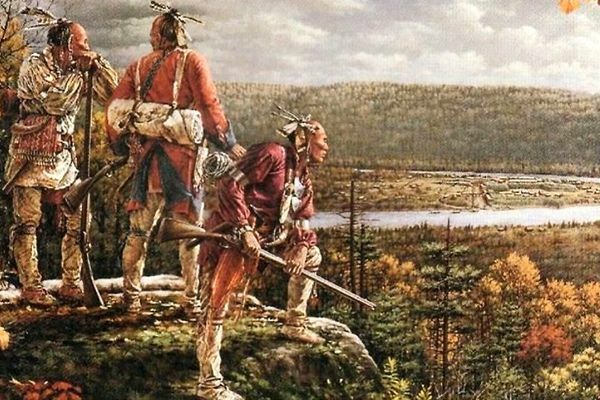 Early on March 15, 1697, a band of Abenaki warriors raided Haverhill, Massachusetts, killing 27 people and taking captives, including Hannah Dustin and her week-old daughter, Martha. Hannah Dustin (also spelled Duston and Dustan) was born as Hannah Emerson on December 23, 1657, to Michael and Hannah Webster Emerson, in the Puritan village of Haverhill, Massachusetts. She was the eldest of 15 children. When she grew up, she married a farmer and brick-maker named Thomas Dustin in 1677 and the couple would have 13 children. She and her family were still living in Haverhill during King William’s War which occurred between 1688–97. The war was fought between France and England over colonial lands in North America. 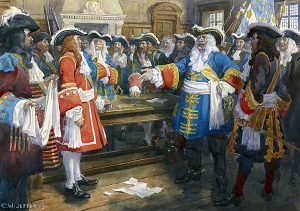 The French, under Louis de Buade de Frontenac, who was the Governor General of New France in Quebec, Canada, frequently incited his Native American allies to raid the English settlements. In 1697, the Dustin family were living in a house on the west side of the Sawmill River with their nine surviving children. On March 9th, Hannah had just given birth to their 12th child Martha. A neighbor, Mary Neff, was staying with them to help care for her and her new baby. 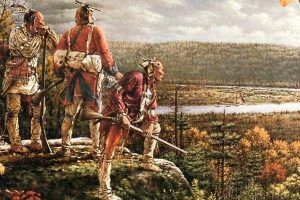 Just six days after Martha’s birth, on March 15th, Abenaki Indians from Quebec attacked Haverhill, killing 27 people, taking 13 captives, and burning six homes. Among those captured were 40-year-old Hannah, her 6-day-old baby, and her friend 51-year-old Mary Neff. Thomas Dustin, who had been working in the fields during the attack, heard the shrieks of the raiding party and was able to save the other children but was too late to save his wife and baby. After the Indians captured the women and the baby, they set the house on fire. 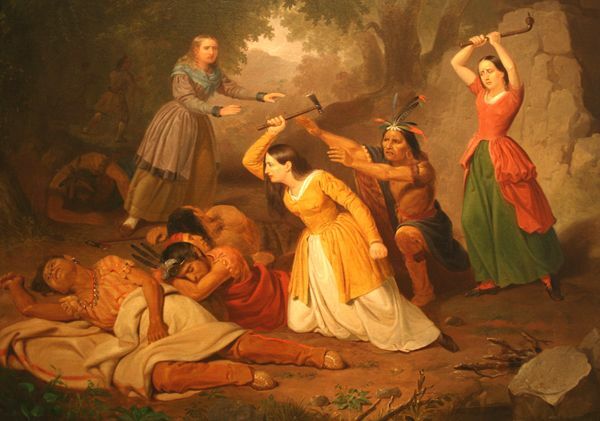 As the Indians marched their captives into the wilderness, Mary Neff was carrying baby Martha and having trouble keeping up with the rest of the party, one of the Indians took it from her and murdered the infant by smashing her head against a tree in front of her horrified mother, Hannah. During the long journey, the Indians told their captives stories of how they would be treated upon their arrival in Canada. There, they would be stripped and made to “run the gauntlet”, jeered at and beaten, and sold as slaves to the French. After traveling for nearly six weeks, the group arrived at the junction of the Contoocook and Merrimack Rivers. There, 12 of the Indians took Hannah, Mary Neff and a 14-year-old boy named Samuel Lennardson, who had been captured in a raid in Worcester, Massachusetts some 18 months before, and left the main party. This smaller group then proceeded toward what is now called Dustin Island, near the present town of Boscawen, New Hampshire. Here, they planned to rest for a while before continuing on the long journey to Canada. In the camp, the Indians relaxed, seemingly unworried about their captives. However, some six weeks after they were captured, Hannah woke Mary Neff and Samuel Lennardson while the Indians were sleeping. Armed with tomahawks, they killed 10 of the 12 sleeping Indians, including two adult men, two adult women, and six children. Two of the Indians — an injured woman and a boy, were able to escape into the woods. The three captives then piled food and weapons into a canoe and made their escape down the Merrimack River. However, Hannah suddenly realized they needed proof of their story, and the three returned to the island and scalped their victims before setting out again. The traveled downriver at night and hid in the woods during the day. The last portion of their journey was on foot. Finally, after several days, they reached Haverhill in safety. The Massachusetts General Court later gave them a reward for killing their captors; Hannah Dustin received 50 pounds, and Neff and Lennardson each received another 25 pounds. The Dustins used their money to buy additional land in the area, enough to provide farms for several of their children. Hannah went on to have another child in October 1698. 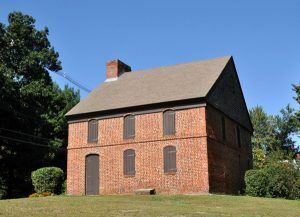 Her husband Thomas died on November 17, 1732, and she went to reside with her son, Jonathan, who lived on the southwest part of the original Thomas Dustin farm. She died four years later on March 6, 1736 and was buried in Haverhill, Massachusetts. While the event was well known locally for years, it became more widely known when the Reverend Cotton Mather told her story in a book in 1702. 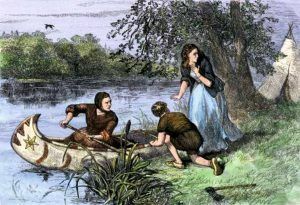 Long after her death, she became more famous in the 19th century when her story was retold by Nathaniel Hawthorne, John Greenleaf Whittier, and Henry David Thoreau. Before long, the Dustin’s story was included in American history books, children’s books, and magazine articles. She was the first American woman honored with a statue in 1874. 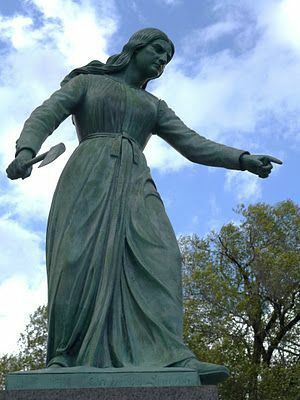 The Hannah Duston Memorial was the first publicly-funded statue in New Hampshire. It is located at 298 US Route 4 in Boscawen, New Hampshire. Another statue stands in her hometown of Haverhill, Massachusetts in Grand Army Park. It was erected in 1879. Also standing in Haverhill, is the Dustin House, which was under construction during the Haverhill raid of 1697. After Hannah returned from captivity, Thomas Dustin completed the home which stood about a half a mile away from their previous house. One of a very small number of surviving period houses built out of brick in Massachusetts, it stands at 665 Hilldale Avenue.